At the heart of the matter for the metal stamping industry is the secondary consequence of the uncertainty: higher prices on imported steel and aluminum. According to the U.S. Department of Commerce’s 2017 Section 232 investigation, imports of steel and aluminum goods covered within its scope totaled nearly $48 billion, or about two percent of total U.S. imports. Steel imports were a little over $29 billion; aluminum reached ~$19 billion. Another statistic it reported: the U.S. is the world’s largest importer of steel. Our imports are nearly four times our exports. And while it is cause for concern for every responsible company that depends on steel and aluminum products, we’ll leave the larger discussion—with talking points and ramifications that are wide, vast, and deep—to the experts at global trade on every side of the situation. Let’s talk about the initial direct effect to our industry. It was widely anticipated that unless the steel you were using was sourced domestically, prices were going to go up. Unfortunately, the domestic mills have used the volatility in the markets driven by the tariffs to raise their pricing. Domestic mills did not use this opportunity to increase capacity; instead they increased pricing per pound. Why did they do this? Because they can. Mills in the U.S. increased pricing upwards of 20 percent on the heels of the implementation of the tariffs. These increases were immediate and across the board on cold-rolled and stainless steel—which is the majority of the steel we process at Larson. Unfortunately, some of our customers were subjected to these increases. There is some good new, here! For a majority of our customers, Larson’s proactive approach of material negotiating through our vendor managed inventory (VMI) program protected them from the market’s recent volatility. The program is uncomplicated in its design: we get forecasts and POs from our customers; we secure the necessary material; and, based on customer releases, customers receive their orders on time, with locked-in pricing. It’s a self-sustaining, worry-free process for all involved. Our VMI program was well established prior to any tariff discussions at the federal level; we’ve been operating our precision metal stamping and deep draw stamping manufacturing this way for years. Larson collaborates with customers with a shared mindset of common goals. We’re all vested in controlling costs, quality, lead time, and inventory. Customers trust us to manage their tooling, stamping, and production runs. Having us monitor their forecasted releases to keep it all running on time is the natural extension of that relationship. Through a VMI agreement, we maintain customers’ supply chains, regulating the flow of materials, which allows us to operate with a plan that mitigates the impact of unforeseen surprises in cost and supply. We can be flexible with our customers because we secure material and manufacture product just in time, allowing for same-day delivery. This is how a forecasted release ensures 100% on-time delivery. Certainly, we have no control over this political minefield. It impacts our industry and we are as concerned about it as you are. So … how can we insulate you from market fluctuations? The first piece of that is our buying power. Working from a secure forecast—based on customers’ forecasts—allows us to confidently buy approximately 14,000 tons of steel a year, so the mills we work with are willing to lock in pricing with us. Through our VMI program, we then set up a contract with customers that want to enter a VMI agreement with us; we are then able to pass on that pricing lock to customers. Larson customers with VMI programs have not seen pricing swings this past year. VMI is especially beneficial for customers with smaller to mid-volume projects that can forecast their demand. These are the companies that can best take advantage of the favorable pricing we get with our buying power. 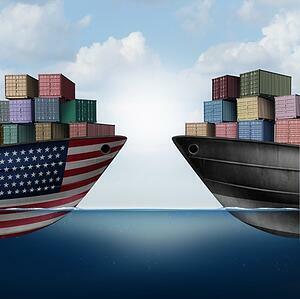 Whatever uncertainties loom with the multi-faceted tariff situation, with a VMI program, we can assure you stability in pricing, quality, and delivery. Contact us about extending our partnership with you and ask about creating a VMI program for your company.